Researchers at Cornell University conducted trials over four seasons to examine the best approaches for combining spring flowering bulbs with perennials in the garden or landscape. The study, along with extensive lists of successful combinations, is now available on the university’s website at www.hort.cornell.edu/combos. In their work, the researchers also uncovered some core principals for creating successful bulb and perennial combinations. For gardeners planning to plant bulb and perennial combos this fall, the information could be very useful. Following are tips for successful bulb and perennial combinations for the spring garden from the Cornell team in Ithaca, New York and the Netherlands Flower Bulb Information Center of Danby, Vermont. Plant bulbs likely to perennialize well in your area. Some combo plantings are more successful than others. Sometimes the perennials come back but the bulb flowers don’t. Most often, this problem occurs when the wrong bulbs are chosen for local climate or growing conditions. For example, choosing Jonquilla narcissi, hardy in USDA zones 5-9, for planting in much colder USDA zone 3 is unlikely to work out. Other times, the gardener may choose the right bulb type, but a less durable variety. 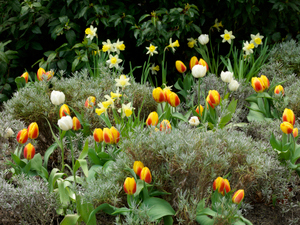 With tulips, for instance, look for bulb packaging marked “good for perennializing” (likely to return for at least three years) or “good for naturalizing” (likely to establish and multiply in the garden). Consider each plant’s seasonal growth habits. What looks good in the mind’s eye may not look as good in the early spring garden. This can happen when choosing companions based on their mature description without considering their springtime rate of growth and look at that time. In spring different plants emerge and fill out in different ways, often featuring different coloring than later in the growing season. The goal of companion combos is to select perennials and bulbs that emerge together to work well in spring and early summer as partners either aesthetically (with complementary or contrasting foliage and flowers) or practically (with sufficient perennial foliage to mask the bulb’s fading foliage after bloom). The Cornell project addresses this very subject. Other tips are available from garden writers, bulb and perennial labels, plus garden catalogs and websites. Consider mature plant size. Unlike annuals, which normally grow large and flourish in a single season before dying away, perennials may take several seasons to gain maturity. If, for example, you are planning for a perennial to grow to a certain size in relation to your bulb planting, be sure to calculate when the perennial will reach that size. It may be necessary to plan for several bulb companions for your perennials over initial seasons, changing bulb choices as the perennials mature. Rather than a drawback, consider these as opportunities to play with bulbs as seasonal accessorizing. Plant just enough bulbs. This might be considered the “Goldilocks” tip. Plant too few bulbs and the look is sparse. Plant too many and face over-crowding. Refer to bulb packaging, catalogs or websites for suggested spacing. Allow for perennial spread. Different perennials have different growth habits. Some are aggressive growers with a tendency to spread. Others are late to leaf out and have a compact growth habit. For the aggressive spreaders, allow space for them to fill in. For more compact perennials, plant bulbs closer in. These considerations pay off when perennials’ late spring growth successfully hides bulb die-back after bloom. Planting depths, well-drained soil, nutrients and moisture are among other things to consider. In general, smaller spring-flowering bulbs such as crocuses and grape hyacinths are planted 5-inches deep and larger bulbs such as tulips or narcissi are planted 8 to 9 inches deep. Other factors that affect success with bulb and perennial combinations include drainage, moisture, nutrients, and timing. Most plants, and bulbs in particular, thrive in soils that drain well. The Dutch have a saying, “Bulbs don’t like wet feet.” Standing water can rot the roots of bulbs. This is true of many perennials as well. Many gardeners amend soil by mixing in compost, well-rotted cow manure or other organic matter to increase chances of gardening success. All plants need sufficient moisture to thrive. Bulbs, once established, are extremely drought tolerant. Indeed bulbs are literally underground storage systems for moisture and nutrients. The key time for watering spring-flowering bulbs is after they’re first planted in the fall. This is when the bulbs establish roots. Once the roots are established, Mother Nature usually provides all the moisture that is needed. As for nutrients, when planted, bulbs carry all the nutrients they need for their first season of blooming. For perennializing or naturalizing bulbs, it’s advisable to add a top dressing of slow release fertilizer or compost or well-rotted cow manure in either fall or in early spring, before the bulbs flower. Fall is prime time to plant perennials and spring-flowering bulbs. For bulbs, the ideal planting time is approximately six weeks prior to hard frosts to allow for robust rooting in cool autumn soil. The farther south you are, the later you plant. In northern gardens, bulbs are typically planted in late September through mid-October. In warmer areas, bulb planting may be delayed till November and December. Even planted late, bulbs are programmed by nature to survive. Whatever the case, get bulbs in the ground (or pots) the same season you buy them as they are not dormant like seeds and will not last till next fall. By following these practical tips, it’s easy to create bulb and perennials combinations that will add a true bit of spring magic to any garden or perennial bed. For information about the Cornell University Department of Horticulture visit www.hort.cals.cornell.edu. For flower bulb info, visit www.bulb.com. To visit the Cornell Bulb & Perennials Combinations website, visit www.hort.cornell.edu/combos.